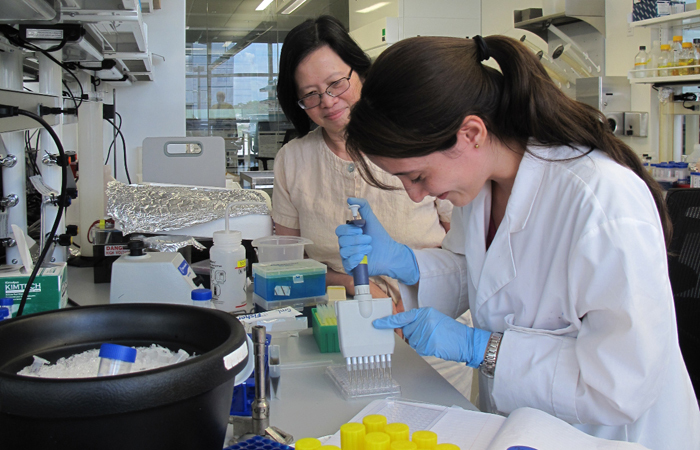 Biomolecular Sciences Institute Director Yuk-Ching Tse-Dinh, left, working with a student in her lab. FIU scientists are battling prostate cancer at the cellular level. Researchers from FIU’s Biomolecular Sciences Institute (BSI) and the Herbert Wertheim College of Medicine believe they can eradicate prostate cancer that returns in patients who were treated by castration. Castration-resistant prostate cancer has no known cure, with 75 percent of patients dying within five years of onset. The problem lies at the very core of the human body — DNA. When damage occurs within a person’s DNA, it can cause a mutation in the DNA sequence. This is typically fixed by a process called DNA repair, a function that exists in all cells. It is typically a good thing, except when it comes to cancer, where the repair actually helps the bad cells thrive. To make matters worse, DNA repair in cancer cells occurs at a higher and more efficient rate than in normal cells. So while normal cells go through a natural life cycle in which they replicate and eventually die off, cancer cells keep multiplying. The BSI researchers believe that by stopping the DNA repair, damage will build up in the cancer cells causing them to die, essentially killing the prostate cancer. Experts in drug screening, DNA repair and cancer biology, BSI Director Yuk-Ching Tse-Dinh along with biochemist Yuan Liu, both from the College of Arts & Sciences, and cell biologist Irina Agoulnik from the College of Medicine are leading the research. The institute has been awarded a $50,000 grant from The Community Foundation of Broward to fund the research project. The researchers hope to establish a novel method for screening and determining which compounds will most effectively block DNA repair in cancer cells without affecting normal cell growth. “We anticipate that within the timeframe of this project, we will discover a new class of compounds that can be developed to treat advanced prostate cancer disease,” Agoulnik said. According to the researchers, it is likely that the compounds identified in this study may also be effective in curing other cancers and relieving the symptoms of neurodegenerative disorders including Alzheimer’s, Huntington’s and Parkinson’s diseases. “With the support from the Community Foundation of Broward grant, we will develop an innovative method for measuring DNA repair capacity in prostate cancer cells that will be used for screening small molecules to reduce DNA repair capacity in cancer cells,” Liu said. Dedicated to advancing nanotechnology and furthering the fields of cancer biology and neurodegenerative disorders, BSI is a collaboration of FIU’s College of Arts & Sciences, College of Engineering & Computing and Robert Stempel College of Public Health & Social Work. The Community Foundation of Broward award is part of the organization’s Ignite! Innovation Grant Program created in an effort to support innovative ideas that solve community problems. Grants are awarded to organizations that lead boldly and challenge themselves to present innovative and unique projects.